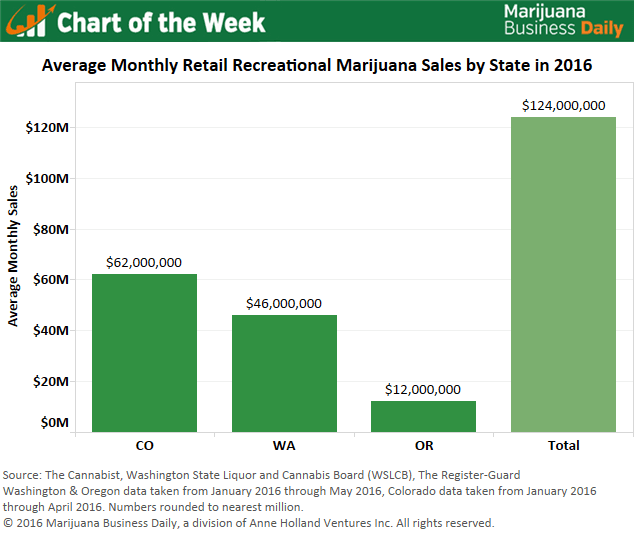 Colorado, Oregon and Washington State are averaging a combined $123.5 million in monthly recreational marijuana sales so far this year, putting the industry on pace to rack up at least $1.5 billion in adult-use cannabis revenue at the retail level in 2016. The three states have all seen sizable monthly increases in recreational marijuana sales, underscoring the continued growth potential for this side of the cannabis industry. If sales continue to grow on a monthly basis at current rates in these states, overall adult-use revenues could hit $1.8 billion or possibly even touch $2 billion this year. Alaska also is expected to get its recreational industry up and running in the second half of 2016, which will push the final tally even higher. Monthly sales of recreational marijuana in the nation’s largest and oldest adult-use market, Colorado, averaged $62 million from January through April (the state has not yet released May data). Month-to-month growth has been somewhat uneven, but it averages out to a robust 7%. Colorado’s rec industry hit a record in April, when sales totaled $76.6 million largely due to the 4/20 holiday. In Washington State, recreational marijuana sales from January to May totaled $229 million, equating to a monthly average of $46 million. The state got off to an extremely slow start and lagged severely behind Colorado for a while, but it has made up some ground as of late. Sales have grown about 5% a month so far this year in Washington, setting new records for the state in each of the past five months. With Washington’s move to eliminate all medical marijuana dispensaries by July 1, 2016, the recreational industry could see a huge influx of new customers, meaning sales could rocket. Oregon is the newest player on the market, having started rec sales through existing dispensaries last October. During the first five months of the year, roughly $60 million worth of recreational marijuana was sold in the state, according to sales tax data released last week. Oregon’s recreational market is still taking shape, as the first retail stores licensed specifically to sell recreational marijuana will open later this year. Dispensaries are limited in how much recreational marijuana they can sell now, and the state only just recently allowed them to provide the adult-use market with edibles.